This article is about the Fallen Archon. For the Vex unit, see Fanatic. "I do not fear the dead! I CONTROL death, and you... more use to me alive. Go! Pursue your vengeance!" Fikrul, the Fanatic, is the leader of the Scorned Barons, and the Archon of the Scorn. As the only member of the group to escape capture, he fled into hiding while his comrades were imprisoned within the Prison of Elders. Fikrul believes that the Scorn are the natural evolution of the Eliksni, and that through his leadership, the race can find immortality. He is a Chieftain class Scorn leader, and the boss of the Nothing Left to Say Story Mission as well as the Hollowed Lair Strike. Due to the nature of his resurrection abilities, Fikrul can seemingly never truly be killed, and has retorted that he will continue to return to seek vengeance upon the Guardian. Fikrul was once a well-regarded Archon Priest of Kaliks Prime within the House of Wolves, but he was cast out after speaking against the Great Machine and lamenting his species' dependence on Servitors for survival. His words would later influence the techno-deviant Devil Splicers of the Plaguelands, while Fikrul himself explored his own darker interpretations of faith. Fikrul would go on to ally with a group of six lowly Dregs cast out from the House of Exile, who collectively titled themselves the Scorned Barons. Together they unleashed havoc amongst the Awoken and various Fallen Houses in the Tangled Shore, ultimately leading to the demise of the House of Wolves through the destruction of all their Servitors. They would later become captured in a final standoff between Cayde-6, Petra Venj, and their posse of Guardians; leaving only Fikrul as their Archon to escape imprisonment at the Prison of Elders. At some point following the Taken War, Prince Uldren formed an alliance with the House of Kings, and in his search for Mara Sov he discovered a mortally wounded Fikrul. Uldren wished that he could save the dying Fallen; his wish was heard by Riven, the Taken Ahamkara residing in the Dreaming City, who Uldren had long ago brought to the Reef as a hatchling. Riven granted Uldren's wish by infusing some of Uldren's Darkness into Fikrul's Ether, creating Dark Ether and raising him as the first Scorn. Fikrul thereafter treated Uldren with devotion and reverence, calling him "Father" and believing that Uldren had granted him his new life and powers. In gratitude, Fikrul would assist Uldren in taking over the House of Kings, usurping Craask, Kell of Kings whom conflicted with his ambitions. In a grand betrayal, Uldren summoned Fikrul to dock Craask of all four of his arms and reduce the former Kell to the rank of a Dreg. 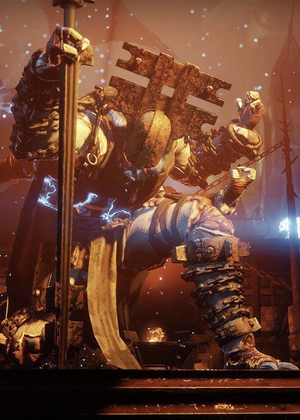 Rumors later circulated among the Fallen that Uldren and Fikrul had slain Craask outright, along with the entire House which Fikrul then raised as the first undead Scorn with his Dark Ether. A year after the Red War, both Uldren and Fikrul were caught by Cayde-6 and taken to the Prison of Elders. When Variks, the Loyal; an old friend, imprisoned Fikrul, he asked about the whereabouts of Kaliks Prime. Variks asked him if he betrayed the last Prime to the Taken and if that is the source of his corrupted ether. Fikrul replied that Kaliks has actually abandoned the Eliksni altogether. Following Riven's machination, Uldren took advantage of Variks' waivering loyalty and tricked him into releasing the prison's inmates, causing the Scorn to breakout out en-masse. Fikrul appears to see the Scorn as a family, as he refers to Uldren as "Father", calls the other Scorn Barons his friends, and calls his Scorn underlings his children. This is further supported by his genuine outrage at the other Barons' murder at the hand of The Guardian, as well as his willingness to resurrect his inferiors, as well as any deceased Fallen as Scorn (although the latter could easily be more driven by his goals and his need of an army to complete them). He also doesn't believe in killing without purpose (he only kills to "immortalize" an Eliksni or further his sense of righteousness), and as such berates The Guardian for murdering the Scorn Barons just to pursue revenge. It also seems that he genuinely cares for the Eliksni species, as he howls at The Guardian for murdering countless Fallen, who have done nothing but try to survive. Overall, it seems Fikrul is more of an anti-villain; he has sympathetic intentions and is far from truly evil or immoral, but he is still willing to commit dark acts to carry out what he perceives as good or just. Fikrul engages the player with his signature lightning staff, which fires charged Arc projectiles that can break a Guardian's shield in just a few hits, akin to a Wire Rifle. He will also use his staff to summon large electric circles known as Wrath of the Scorned, which can summon lesser Scorn units; these circles take up a large space and can deal heavy shocking damage over time to anyone that stands within it. Occasionally, whenever his health reaches a certain threshold, Fikrul will surround himself with Void energy to render him immune to all damage shortly before teleporting the player into the air, surrounding himself with a random elemental shield, and tethering them to his staff, dragging them towards him so he can smash the ground to break their shields and knock them back. To keep up his attack, he will teleport towards the player and overwhelm them with high-impact electric staff projectiles. Fikrul's powerful attacks and tether ability make him quite possibly the most dangerous Scorn Baron to engage, for the only safe way to engage him is keeping as much distance between him and oneself as possible. "I hope you give my children a better fight than your friend Cayde..."
"Yes yes yes! Killing is what you do! Killing is ALL you do!" "You enjoyed killing them? You enjoyed putting them in dirt - where you belong? Did it make you feel good? Kaniks... Reksis Vahn... Yaviks... Pirrha... Araskes... Hiraks... Elykris... Tell me that killing my friends made you feel good. TELL ME!" "Tell me... I wish to know how I feel when I kill you." "I will pay any price... to be there when you die!" "Hello, dead thing. Come to slaughter MY children? Perhaps you die in exchange!" "It brought pleasure, killing my friends, I'm sure! Uncontrollable bloodlust, taken out on all held dear..."
You die, the Scorn Barons rise again! Take back the Shore..."
"Face me! Show me what you are..."
"Dead thing... Murderer... Killer... Come, killer! I return the favor..."
"We... are alike. Trapped in death... a never-ending dance." "You lack purpose, dead thing. Killing just to kill. I will show you your end when I return..."
Fikrul is the third English-speaking Fallen observed, behind Variks, The Loyal and the Spider, but is the first Fallen antagonist to speak the language. Fikrul refers to Uldren Sov as Father, likely out of gratitude under the belief that Uldren gifted him with his powers. For some reason, he appears to not be able to just revive all his brothers and sisters. Only Elykris has returned as the heroic public event boss. It could be that some of the Scorns bodies were destroyed by the Guardians leaving nothing to resurrect. An example of this would be Reksis Vahn, the Hangman whose body was incinerated after he was killed and Hiraks, the Mindbender whose body was lost when his Ascendant realm collapsed after he died. In his dialogue, Fikrul will sometimes refer to the Guardian as "dead thing". This is most likely a reference to the Grimoire card Legend: The Black Garden, in which the Thanatonaut Pujari is called this by a Ghost in the shape of a flower within his vision of the Black Garden. Fikrul's statements of "Killing is ALL you do!" and "Killing just to kill" are also similar to this. Fikrul's rebellion against the Traveler could be the reason why Kaliks Prime abandoned the Elinski. While it is currently unknown if this trick works in the Nothing Left to Say mission, breaking Fikrul's elemental shield while being tethered in the Hollowed Lair strike causes Fikrul to be momentarily stunned, negating his Ultra Smash and granting you a few-second window to do free damage. Whether this is a bug or an intentional weakness is unknown.